Play More Games: Free Same Day Delivery! Yep, believe it not there are a few developers out there that thought releasing a game 5 days before Christmas is a good idea! There are some heavy hitters coming out this week. 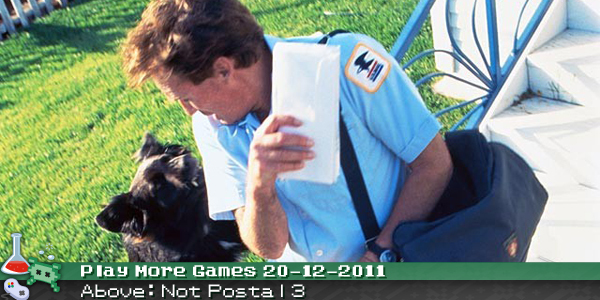 First up is Running With Scissors’ magnum opus Postal 3. I’m glad RWS was able to push this game out the door as I have been dying to continue the saga of The Postal Dude. *Hopefully we’ll be treated with some stunning revelations regarding his past history with the shady organization known as FedSex. I know that when I was finished with Postal 2 I immediately began an online petition/campaign demanding Postal 3 be rushed out as quickly as possible as I just had to see the conclusion of The Postal Dude’s journey. It’s probably for the best that Running With Scissors ignored my email campaign, and instead spent the last 7 or so years polishing the title so we’re almost guaranteed to be treated to something special this time around. I simply cannot wait! Also on the docket this week is the latest indie title by noted garage developer Bioware. Those guys made an MMO based on some obscure sci-fi property by lauded indie filmmaker George Lucas, of American Graffiti fame. It is reported that every single character in The Old Republic is voiced, unfortunately I don’t think Richard Dreyfuss made the cut. If you’re gonna try and take down the giants of the genre you would think Bioware would try to hire someone like Dreyfuss to voice your Jedis and Darth Siths. 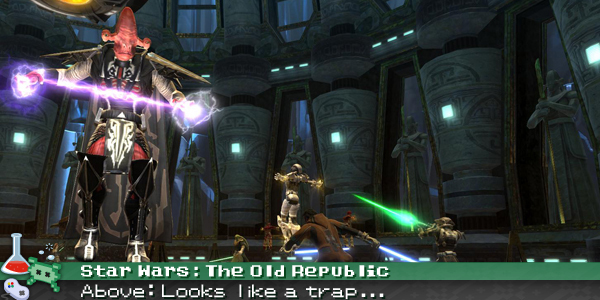 Just a fare warning (that you don’t need) but if you do end up giving The Old Republic a try at launch, you should expect long queue times and tons of instability. MMOs usually don’t stabilize for months after launch but you probably already knew that! Also, let me know what you think of it. It was pretty high up on my must watch list, but slowly fell off the radar as more information came out regarding the gameplay. I’m curious to see how heavy story style works out in an MMO and find the co-op dialogue tree system pretty damn interesting, but alas, I am scarred from standard MMO gameplay. I sincerely hope Bioware pulled this off though because I’m tired of WoW ruling the MMO space. Earlier this year I talked briefly about my time spent with Trine. It’s a quirky little title that has a fantastic blend of side scrolling platformer action and puzzle gameplay. The backbone of the gameplay rests on properly cycling between the 3 protagonists using the titular magical artifact called the “Trine”. Each of the 3 protagonists, the Wizard, the Thief and the Knight have specific abilities that you use to navigate the game’s levels. The Wizard is adept at creating paths and manipulating platforms, the Thief has ranged attacks and unrivaled manouverability and the Knight has the ability to pick up heavy items, block enemy attacks and so forth. Proper application of each character’s abilities is paramount and you can instantly switch between each character with the press of a button, provided you haven’t killed them off traversing the myriad of traps and enemies littered throughout each level. Mercifully any character that you’ve lost is automatically revived at one of the numerous check points that are liberally sprinkled throughout the levels, so you’re never without one of the heroes for very long. Also, if you’re creative you can find some clever ways to solve puzzles without using the most obvious character (and their abilities), solving puzzles with wacky out-of-the-box thinking is a very rewarding experience. The best part about Trine though? It has co-op! Playing through Trine with my wife was one of the most rewarding, frustrating and hilarious gaming experiences I had in 2011! 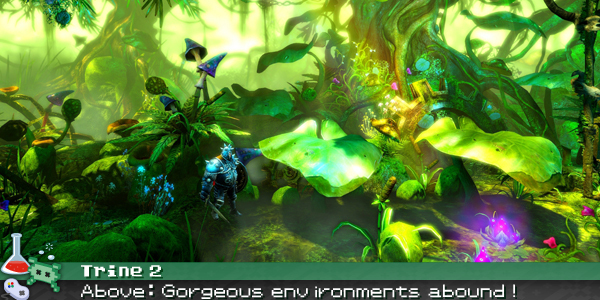 I’ll definitely be posting more thoughts about Trine 2 in the coming weeks so stay tuned. So, have you finished all your Xmas shopping? Do you think releasing titles a few days before Xmas is a good or bad idea? Let us know in the comments and as usual, if you want a full list of this week’s releases check out Amazon.com. *It goes without saying that most of this is BS. Trine 2, holy cow I need to get that. We should play sometime. I’m reading and commenting from my 3DS!